Democrats' favorite progressive, Rep. Alexandria Ocasio-Cortez (D-NY), owes back taxes for a failed business venture. 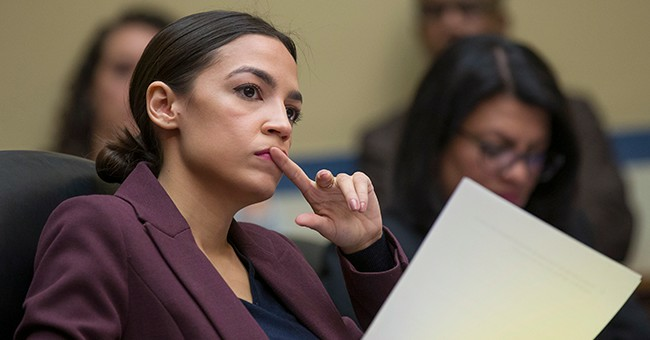 According to the New York Post, Ocasio-Cortez owes $1,877.56 in unpaid corporate taxes. Here's the kicker: the bill is from six years ago. AOC's failed business, Brook Avenue Press, was established to publish books about inner city kids. This is the business that owes state taxes. Rather ironic for a Congresswoman who advocates for taxing the rich, right? On July 6, 2017, two months after Ocasio-Cortez announced her intent to run for Congress, New York State filed a warrant, The Post reported. Brook Avenue Press eventually dissolved in October 2016, something that typically happens when a business fails to pay corporate taxes or file a tax return. A couple weeks ago, Ocasio-Cortez's Communications Director, Corbin Trent, said the taxes would be paid. The Post pushed back and asked again when the AOC planned to pay the State of New York. “I’m her congressional staffer, not her personal accountant,” Trent told The Post. According to The Daily Mail, Ocasio-Cortez started the company back in 2012 when she was 22. She invested $1,000 to rent an office space in the Bronx. A New York City-subsidized program called the Sunshine Bronx Business Incubator helped AOC launch her business. The program was designed to help small businesses in the Bronx. One of their initiatives allowed business owners to pay a monthly rent between $195 and $275 per person. When she had her business, AOC advocated for lower taxes. "You don’t really make a profit in your first year," Ocasio-Cortez said in 2012. "To get taxed on top of that is a real whammy."